Brown steered the 76ers to a 52-30 regular season record and the team’s first playoff series win since 2012. Kevin Kinkead will have more on the extension and what it means for the franchise tomorrow. What’s Eating at Richaun Holmes? 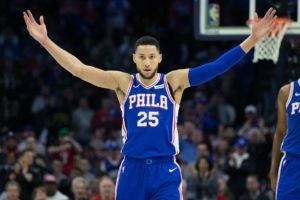 The alleged tweet came after Holmes only played three minutes (all in garbage time after the starters for both teams had been pulled) in the 76ers’ 35th victory of the season. If true, was Holmes finally displaying some displeasure with head coach Brett Brown’s decision to play Amir Johnson 13 minutes in relief of Joel Embiid? Joel Embiid rode a stationary bike while his teammates did five-on-five scrimmaging Monday afternoon. The Sixers center is still limited to half-court 5v5 drills, now 48 hours from the preseason opener against Memphis. Timothe Luwawu-Cabarrot is at the same point as Embiid right now, also limited to 5v5 half-court work. But the big story on Action News is Markelle Fultz’s shot, and whether or not the rookie point guard is doing the right thing by experimenting with some different mechanics during preseason. I asked Brett Brown if we’re reading too much into it. Brown pointed out last week that the tweaks were something Fultz himself started. Fultz said he was only experimenting. CNN’s Van Jones might call this story a “nothingburger,” but we’ll see how Fultz shoots the ball on Wednesday and Friday. Furkan Korkmaz is a project, for sure. After spending the 2016 season overseas, the 6’7″ Turkish swingman was somewhat of a surprise addition to this Sixers roster, considering the crowding in the back court. He’s likely to start the season in Delaware, but the development begins in training camp, where Brett Brown has been focused on one weakness in particular. Part of the defensive improvement comes with bulk, and Korkmaz has already added about 15 pounds to his 175 pound frame. He won’t be finishing around the rim any time soon, but he’s a tall perimeter shooter with plenty of upside depending on how he adapts to NBA physicality. Brown says Korkmaz’s English is further along than Dario Saric’s grasp of the language when the latter came to Philadelphia last season. That’s helped accelerate communication somewhat, whereas Saric, according to Brown, was trying to figure out his language and accent. It’s a group effort to help Korkmaz with the American transition, but he points out one player in particular who has helped him adapt. That applies to Markelle Fultz, whose shot isn’t in need of repair, but could probably be improved. That’s why the Sixers rookie has been experimenting with his mechanics in training camp. This week he started tweaking his free throw motion. Sixers head coach Brett Brown had more to say on the subject. Chip’s gonna be pretty busy soon, but that doesn’t mean he can’t talk a little shop before the game with Brett Brown and Jahlil Okafor. In fact, maybe they can throw some pads on Jah and just throw it up high to him. He’ll prob pull it in with those giant mitts. Brett Brown has traveled the world coaching basketball, while Jay Wright has spent most of his coaching career in the American northeast. Still, they’ve both led and mentored young players from all over, and had to bring them together to play as a team, regardless of personality, beliefs, or background. They have experience. But all of that isn’t much compared to what they just did by conducting “basketball clinics and conflict-resolution seminars” in Jerusalem and West Bank for PeacePlayers International. These are the kinds of guys you want guiding young players on the court, so it’s good that Brown’s players are – on average – barely older than Wright’s.